بس, ژان مارک. (1391). منظر حسی؛ رابطه میان منظر محسوس و فضای عمومی. مجله علمی-ترویجی منظر, 4(21), 20-25. ژان مارک بس. "منظر حسی؛ رابطه میان منظر محسوس و فضای عمومی". 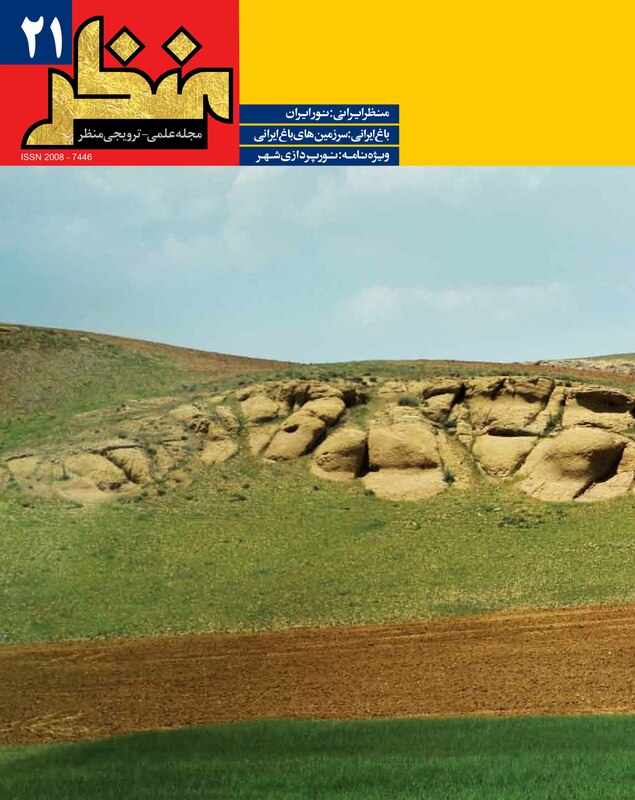 مجله علمی-ترویجی منظر, 4, 21, 1391, 20-25. بس, ژان مارک. (1391). 'منظر حسی؛ رابطه میان منظر محسوس و فضای عمومی', مجله علمی-ترویجی منظر, 4(21), pp. 20-25. بس, ژان مارک. منظر حسی؛ رابطه میان منظر محسوس و فضای عمومی. مجله علمی-ترویجی منظر, 1391; 4(21): 20-25. در فرانسه سابقة‌ پژوهش‌ در حوزه منظر ۲۵ سال پیش با برگزاری همایشی در باب «مرگ منظر؟» آغاز شد2. بعد از انتشار کتاب «نظریة منظر3» اَلن روژه امروز تنها 15 سال است که منظر موضوع مباحث نظری و عملی شده است. بدیهی است که در این میان، سؤالات جدیدی نیز مطرح شد. به‌ عنوان مثال در مبحث روش‌های دسترسی به منظر این مسئله مطرح می‌شود که آیا بینایی همچنان تنها روش است؟ حال آنکه از منظر بویایی، شنیداری و حتی چشایی نیز مطالبی می‌شنویم. همچنین پیشرفت رسانه‌ها (عکاسی، فن سینما و دنیای دیجیتال) و این دنیای مجازی جدید غیرمادی، همگی از روش‌های سنتی مصورسازی4 بسیار دورند. در مجموع امروز، منظر کمتر در وهله‌ اول قابل خوانش است. برای بررسی این وضعیت هستی‌شناسانه باید ابتدا به دوره‌شناسی تحولات منظرین بپردازیم. در این پژوهش به پنج جهت‌گیری اصلی می‌رسیم که مبدأ یا مرکز مباحث منظرین در تفکر معاصر بوده‌اند. Landscape had a natural concept for a long period of time: a panoramic view from a high spot which offered perceived aesthetics and emotional pleasure. Today, this visual or decorative perception is in a crisis either in theory or in project and the relation between landscape and human has become complex rather than ‘natural’. Landscape is not merely allocated to aesthetics and it is used in economics, political, law social sciences as well; from industry to saving energy. The question is what impact does this borderless concept have on legibility of concept and landscape performance? For instance, is vision still the only way of accessing landscape while we hear about smell, hearing or even tasting landscape? Furthermore, media developments (photography, cinema and digital world) and the non-material virtual world are distances away from traditional methods of visualization. Generally, nowadays landscape is less readable in the first place. To examine the ontological status, we have to study landscape transitional periods at first. In this study, we reach a basic decision which is the origin or the center of contemporary thoughts in landscape: every landscape can have a material aspect which is portrayed as a cultural oriented issue, a place to live and to be seen as a manifestation of sensible experience and enthusiastic of development. We might come up to a holistic approach in facing landscape which means simultaneousness of landscape rationalisms separated by modernism. This rationalism includes instrumental rationalism which can be observed in science and techniques; common rationalism which defines common ethical and political beliefs; aesthetic rationalism which encompasses various human encounters with the world; conversational or communicational rationalism which build symbolic framework where principles of common life forms within. The landscape architect has many problems to concern about including matching techniques to space disorders and residents’ requests, the meaning and value of place, enhancing life quality in the site and coordination with social context (beliefs, rational thoughts, conflicts and multiplicity of traditions). These are the issues involved landscape in making thinking methods rather than looking for solutions. Obviously, collecting all these things may not be possible in a form of general landscape consideration, but its necessity is also undeniable. A sensible space seems far-fetched at first; however, in fact it carries a profound result in defining landscape and defining the relation between landscape and human beings. This aspect focuses on sensible approach of landscape and deals with landscape as a sensible space. Considering landscape as a part of human identity, it is not fair to think of it only in the issues of distance and vision. We must be "committed to landscape" and "have a sense" in landscape. We are “landscaping” and we are living with it more than we are able to see it. Therefore, we must be more accurate in the sense that we are committed to landscape; since we can intervene in landscape, landscape is close to us, surrounding us and we are able to connect to it, even physically. The question in making a public space as a sensible space is: How does the metaphoric meaning of public space in analyzing political actions create and visualize spaces, especially urban spaces? The public space is quite rational and agreeable rather than being “abstract”: there exists something else outside. The condition of public space which means “existing outside” has a spatial organization: not being so close for entering personal realm and not so far where the sound of others cannot be heard. Public space in architecture, urbanism and generally in spatial organization requires the art of creating various spaces. 3. The uncontrollable and unpredicted parts of the place: the boundaries between spaces. Margins and edges are evident in other areas of space and identity in these spaces is proposed. It is concluded from these three issues that the multiplicity of approaches to the question of public space is essential. This multiplicity leads to landscape. The primary responsibility of landscape is producing space for interventionists’ encounters in the land. Landscape is a «process» of space, not only due to the presence of human but because landscape is a consequent of a common thing.